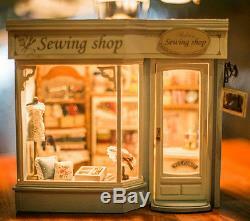 DIY Handcraft Miniature Project Kit. The 19th Century Savile Row Sewing Shop. 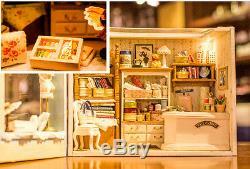 Discover the world of miniatures with this beautiful. When personality is key to your work, then nothing unravels it. With more quirk than this set. Begin a new set of passions. The kit may be small, but it's full of potential! Beautiful decoration for home and ideal gift for friends. Top of range DIY handcraft. Miniature in its kind on the market. 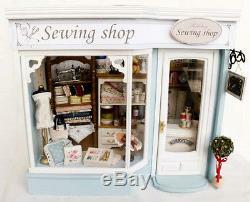 Note: this kit is NOT the pre-made dolls house. But more of a DIY handcraft miniature project. General feedback shows that teenagers. (except handcraft hobbyists) under the age of 14. Would find assembling this kit alone difficult. It will be better if parents can do it together with them. Or help over once needed. 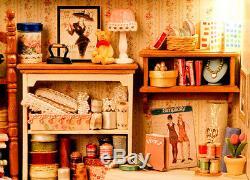 You will receive all the furniture parts &. Contents you see in the pictures. But the furniture are NOT pre-made. You will need to put them together. Note, most contents inside this kit need to be handcrafted. Including furniture and small pieces. This particular kit comes with 5 sound sensor LED lights. It comes with illustrated handbook English. It will help to develop your children's intelligence. 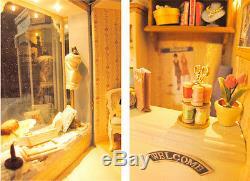 All of our dolls house series come with material packages. DIY handcraft work will be needed in order. To get your own miniature scene. It will take 2 -3 days for this particular kit to be completed. Uch as: paper cutting, pasting, fabric hole making, etc. Patience is always the key element. It is recommended that the. Can individually handcraft this kit is 14. Some advanced kits may suggest the minimum age. Required is 16 or even above 18. The following handcraft tools you will need. Paper scissors, small knife, hole maker, precision. Tweezers, ruler, mini screw driver and high quality adhesive. Material: Wooden framework, abrasive paper. For our DIY hobby craft tool kit. Which is basically all you need. German made UHU adhesive in stock. It is rated the best for this type of kit. 35ml, 60ml and 125ml in stock. If you were to return the item. If it was used in anyway. MOST importantly, the INNER MATERIAL BAGS. MUST NOT be opened, because there are a few hundreds. Small parts inside those material bags. Once opened we can't sell it again as brand new. Please place the material bags and parts. To their original position inside the box. Since many times they were damaged during. The return process, as they were not placed. Since a brand new box will be needed once. 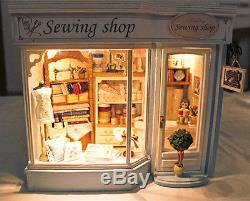 The item "DIY Handcraft Miniature Dolls House The 19th Century Savile Row Sewing Shop" is in sale since Thursday, April 02, 2015.